The surprising news that TNA stalwart Samoa Joe has parted ways with the company that has more or less been his home for ten years, has left many wondering what the future holds for the Samoan Submission Machine and what exactly lead to his departure from the company in the first place? Joe fans need not worry too much though, as he was still involved in the recent UK tour and involved in matches at both the Manchester and London TV tapings, wrestling two matches with Austin Aries that are set to air on the 27th February and 20th March respectively, so you've still got a month of the former TNA World Heavyweight Champion on Destination America, Challenge, Ma Chaine Sport or whatever channel carries Impact Wrestling in your neck of that woods. 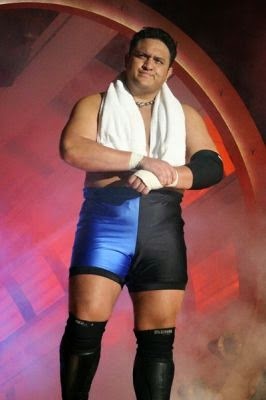 Joe came into TNA in the summer of 2005, debuting in a dominating effort against Sonjay Dutt at Slammiversary at the Impact Zone, whilst still working for Ring of Honor at the time, even defending the companies Pure Championship the night before his TNA debut against Colt Cabana in New Jersey. 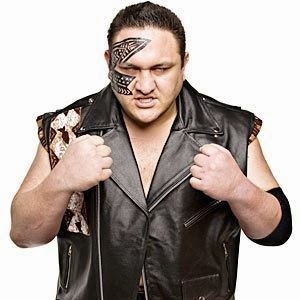 Joe split much of his early time in TNA with Ring of Honor, as well as various Indy companies across North America, England and Australia, such as FIP, 1PW, IWA Mid-South and PWG. Placed immediately into an Undefeated Streak angle, Joe began to fluorish under the wider spotlight offered by TNA, and it didn't take long before he put in his first world class match up for the company, opposite Chris Sabin at No Surrender in July. Joe's debut year may be the strongest in terms of match quality that TNA has seen, as he continued to put in belting matches including two cracking PPV outings against AJ Styles, picking up his first X-Division title , as well arguably the finest match TNA has ever put on, the Unbreakable triple threat match with both Styles and Christopher Daniels. Whilst also being portrayed as an unstoppable and undefeatable force, things looked bright for Joe as TNA began to grow as a company. As the undefeated streak continued, Joe's three way feud with Styles and Daniels continued with strong bouts across the first three PPV's of 2006, although they failed to capture the initial magic from Unbreakable, Joe still managed to pick up his second X-Division title from Daniels at the 10th April iMPACT tapings. Joe moved up to play with the big boys over the summer of 2006, beginning in a feud with Scott Steiner, that included teaming with Sting at Sacrifice, and singles bout at Slammiversary, both of which produced surprisingly good results from a 43 year old Steiner. Following a Falls Count Anywhere against Monty Brown and Rhino at Hard Justice, Joe's form stumbled a bit as he struggled in a dodgy storyline with Jeff Jarrett and Sting. However, the arrival of one man kept Joe on track, that man being Kurt Angle. The pairs feud produced some of the most iconic imagery in TNA's history, from Angle's initial debut on iMPACT in October and into three back-to-back PPV outings between November and January 2007. Although Joe lost his 18 month undefeated streak to Angle, it was clear that working with the WWE Champion was the biggest moment of Joe's career so far. It could even be argued that Joe never managed to reach such a peak again, as the influx of ex-WWE talent began. 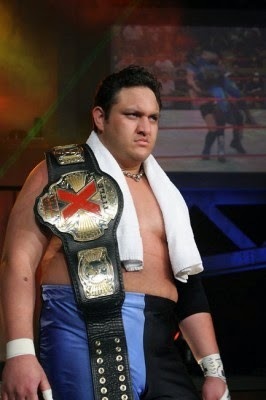 Joe spent most of 2007 chasing the NWA and TNA World Heavyweight Championships, being part of exciting title bouts with Christian Cage and Kurt Angle at Destination X and Hard Justice respectively, whilst also competing in the King of the Mountain match at Slammiversary. Whilst the World title eluded him, Joe did manage his third X Division title in on iMPACT in June beating Jay Lethal and Chris Sabin in a three way, as well his first World Tag Team Championship alongside Angle from Team 3D in July. A Bound For Glory bout with Cage was perhaps Joe's stand out match of the year, as knee injuries began to take a toll on the big man. December's Turning Point featured Joe's infamous shoot promo on Scott Hall who no showed the PPV, which supposedly upset a number of TNA higher ups, including Dixie Carter, who was at ringside. After struggling in a poorly structured on-off feud with Kevin Nash in early 2008, Joe came to life at Lockdown, winning his first and only TNA World Heavyweight Championship, in a career defining steel cage match with Kurt Angle. Going on a 182 day reign with the belt, Joe had successful title defences against Angle, Kaz, Scott Steiner, Booker T, Christian Cage and Robert Roode. Despite this, Joe's matches failed to reach the levels we'd seen previously, and whilst no one would argue his defences were of a poor standard, coupled with lacklustre feuds, Joe's one and only run as World Heavyweight Champion failed to live up to the expectations of the masses. It was unsurprising then that Joe dropped the title to Sting at Bound For Glory. As Joe transitioned into his ridiculous "Nation of Violence" gimmick, that saw him "torturing" opponents backstage for reasons unknown, he was placed in a storyline involving the Main Event Mafia. The storyline initially pitted Joe against the MEM, before it was supposedly revealed Joe had been working for the group the whole time, despite several glarring plot holes, turning on AJ Styles to allow Kurt Angle to win the King of the Moutain match at Slammiversary. Despite picking up his fourth X Division title reign from Homicide at Hard Justice, Joe was lost in the mix with the Main Event Mafia, Taz debuting as his manager and quickly joining the commentary desk did little to help. With the group folding at Bound For Glory, Joe was free to compete in his last truly great match at Turning Point, a re-hash of the Unbreakable three way, this time for Styles' World Heavyweight Championship. If 2009 hadn't been Joe's year, 2010 and 2011 would only get worse. On 18th February, Joe was kidnapped by ninjas, on 19th April Joe returned to TNA and the abduction was never mentioned again. Feuds with Jeff Jarrett, D'Angelo Dinero and Crimson failed to set the world alight, and Joe was put on a losing streak. Unable to win a match for love nor money, losing every single match in the Bound For Glory series. This may have been alright, if Joe's matches at this time were actually worth watching, with a Destination X bout with Kazarian the only stand out bout during this time. Joe's career saw a revitalisation of sorts, as he was paired with Magnus in a floundering tag team division. Not only did the pairing give Joe his second World Tag Team Championship at Against All Odds, it also saw Joe register his best yearly win-loss ratio since his World title year of 2008, as well as a return to form inside the ring. Whilst the pairs battle with Christopher Daniels and Kazarian at Sacrifice was perhaps the only real gem of their run as a team, much of this was down to the lacklustre nature of opponents like Matt Morgan & Crimson and Mexican America, and it was clear that Joe was enjoying his wrestling and mentoring the younger Magnus at this point. Strong contests with Austin Aries, Kurt Angle and Magnus showed signs that Joe may be ready to take a step back into the main event scene. That proved not to be the case as the next two years proved both creatively fruitless and gave Joe worse win-loss records since joining the company. Whilst Joe did manage to return to the main event with a bout against Magnus at Lockdown 2014, the last two years were marred by hot and cold booking and Joe's inability to pull out a single remarkable singles bout. Joe's last title reign came as X Division Champion, defeating Low Ki and Sanada for the belt at Impact tapings in June, however an injury cut short the reign before it could get vaguely interesting. This year saw Joe working more of less as a bouncer for MVP's Beatdown Clan faction, a role that didn't seem to capture Joe's attention as he looked noticeably sluggish and almost bored whilst on screen with the group. 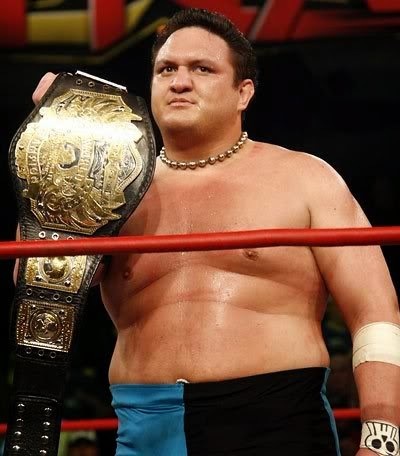 Although we'll never get to see how the situation may have played out had Joe remained with the company, I wouldn't have held out much hope that we would have seen anything close to the Samoa Joe that captured the world wide spotlight in '06 and '07. So, what exactly lead to Joe deciding to move to pastures new? 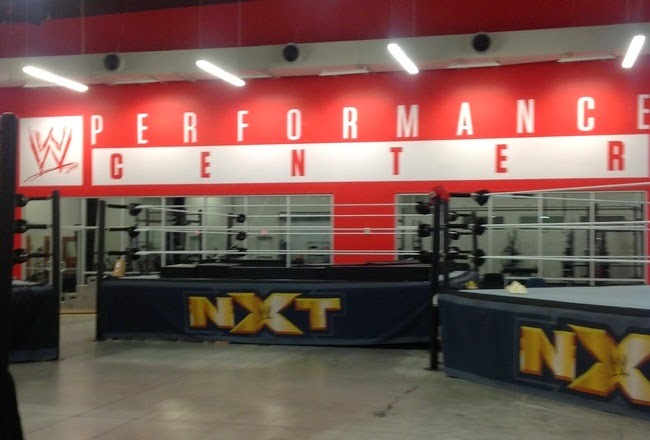 It's clear that Joe's relationship with the company has been fragile at best over the last few years, it even seemed like he would leave the company at the end of 2010. The fact that Joe only capture the World Heavyweight Championship once in ten years with the company is testament to TNA's failure to turn Joe's early momentum into anything lasting, instead they opted for the quick fix of handing runs to ex-WWE wrestlers like Mick Foley, Rob Van Dam, Jeff Hardy and Mr. Anderson during a time when Joe should really have been coming into his own as a franchise player for the company. It's impossible not to draw parallels between Joe's time in TNA and AJ Styles' who departed in 2013. Both were overlooked by TNA for a long time in favour of ex-WWE competitors, and both should have been the cornerstone of TNA's main event scene for years, ending up in a similar situation to what we John Cena feature in for WWE today. However, the real difference between Styles and Joe is Styles' attitude, as he continued to look motivated with the company, pulling out solid performances throughout his tenure, often in spite of piss-poor booking, whilst Joe appeared to become disenchanted, gaining weight and losing the pace that made him stand out in the first place. Of course, Joe's well documented knee injuries also added to the situation. At thirty five years old, Joe could still have a good few years of regular performances in him. That's if he regains his mojo and puts the work in, and of course, depends heavily on how his injuries are holding up. WWE, at this point, wouldn't seem like an option, as whilst many cite Triple H apparently being a big fan of Joe's work, it's Vince McMahon that would ultimately stand in the way of Joe turned up in the 'E. Whilst matches with the likes of Cesaro, Daniel Bryan and Dean Ambrose would certainly get the fans talking, I can't imagine McMahon would see much value in Joe debuting straight onto the main roster and whilst a stretch in NXT wouldn't be entirely out of the question, with Joe able to offer a lot to the likes of Hideo Itami, Kevin Owens and Sami Zayn, it would most likely be in the role of a trainer in the Performance Center, which houses a number of performers who never made it to the WWE. The most likely outcome though, is that we'll see Joe return to the Indy scene. I'm sure Ring of Honor has already been on the blower to try and sort out some kind of deal, even if that's only for a handful of matches, rather than a full time contract. Matches with Christopher Daniels, Jay Briscoe and Adam Cole could prove fruitful for both Joe and his opponents as well as PPV buys. Japan is also becoming an increasingly appealing alternative to the main US companies, with New Japan the biggest of these options, and Joe's previous experience with Zero-1, Pro Wrestling NOAH and Wrestle-1 could prove vital in getting a deal done. Whatever Joe chooses to do with his time, we hope to see him return to enjoying his wrestling and produce the quality of match-up that we've seen him produce in the past, whilst also giving back to the younger up and coming talents with his knowledge of the business. We'd like to wish Joe the best in whatever he does.